The Second Era saw Emperor Tiber Septim wage a series of wars with the goal of conquering or otherwise pacifying all of Tamriel. At his side was the Imperial Battlemage Zurin Arctus. The final years of the era saw the Empire turn its attention to Morrowind. Rather than wage war, the Tribunal signed an Armistice. While the exact terms were never disclosed, it was speculated that the living god Vivec agreed to give the Empire Numidium—a colossal brass golem created by the Dwemer—to aid in conquering the Summerset Isles. It was further speculated that Zurin Arctus played a major role in brokering the Armistice. With the power of Numidium, the Empire could easily conquer the Second Aldmeri Dominion, but there was a problem: Numidium would not function. By Tiber Septim's order, Zurin Arctus crafted a magical artifact that gave its bearer the power to control the Empire's new weapon—the Totem of Tiber Septim. The Battlemage also placed a seal on the Totem; anyone not of the Septim bloodline (or at least, a royal lineage) or possessing a particular supernatural quality would be killed if they attempted to use it. But the Totem was not enough; Numidium lacked a power source. The Dwemer had originally used the Heart of Lorkhan, but this was no longer available. Undeterred, an alternate source of power was devised, a massive green gem known as the Mantella, which was infused with Arctus' own life force. Numidium was reactivated in 2E 896 at Rimmen in Elsweyr, and the Isles were no match for its terrible might; it is said that the siege of Alinor lasted only an hour before the Altmer surrendered. [UOL 1] Tamriel was united, and the emperor declared the beginning of the Third Era beginning the following year. Tiber Septim betrayed his Battlemage, however. Once the Empire's enemies were defeated, the emperor began using Numidium to crush the neutral royal families of Tamriel and install loyalists. Zurin Arctus, furious at this misuse, fought to reclaim the Mantella. In the battle that followed, both the Battlemage and Numidium were annihilated and the Mantella—their shared "heart"—was blown into the netherworld of Aetherius. The Totem of Tiber Septim was also lost as the remains of Numidium were scattered across Tamriel, and Arctus, cut off from the Mantella, fell into a state of semi-slumber in a subterranean vault somewhere in High Rock. As the Third Era progressed, the Empire's elite soldiers—who would come to be known as the Blades—were tasked with collecting the remains of Numidium. Zurin Arctus became known as the Underking, and sent his minions forth to search for the Mantella. Another account claims the Underking was Ysmir Wulfharth, a High King of Skyrim in the First Era, who periodically returned to life at several points in history, and was a mortal avatar of Shor[UOL 1] (the Nordic version of Lorkhan). His later incarnation, the Ash-King, is said to have been summoned back to life to fight the Dwemer at the Battle of Red Mountain in the First Era, and again to Red Mountain in 2E 572 to repel the Second Akaviri Invasion. Some accounts of the latter battle refer to the Ash-King as "the Underking". Wulfharth the Underking was an advisor to and secret magical ally of Hjalti Early-Beard, who would in time become Emperor Tiber Septim. When the emperor turned his attention to Morrowind, the Underking urged him to conquer the land, as Wulfharth had long hated elvenkind. However, the Armistice was signed instead; Wulfharth felt betrayed by the concessions given to the Dunmer and abandoned the Empire. Without the Underking, Tiber Septim abandoned hope of creating a united Tamriel. Meanwhile, as Numidium now belonged to the Empire, Tiber Septim had Zurin Arctus research it. The Battlemage eventually learned of the Battle of Red Mountain, of Numidium's true purpose and power, and of the Underking's involvement. However, his research was based off incomplete Dwemer plans. Arctus came to the conclusion that Numidium was powered by the "heart" (life force) of Lorkhan's physical body—that is, his mortal avatar, Wulfharth. Upon hearing this revelation, Tiber Septim realized that with Numidium, he could complete his conquest of Tamriel, and set a trap for Wulfharth. The Underking returned upon being told the emperor had decided to attack the Tribunal after all, but was met by the Imperial guards. A battle ensued, in which Zurin Arctus cast a Soul Trap spell on the Underking. As he died, Wulfharth's "heart" tore a hole through the Battlemage's chest, killing him. The emperor then appeared, collected the soul gem containing Wulfharth's heart (the Mantella), and covered up the incident by claiming Arctus had been killed while attempting a coup. 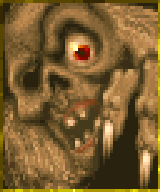 Numidium was then used to conquer Summerset Isle; shortly after the battle, a "rotting undead wizard" appeared and blew Numidium to pieces, though he was then crushed by the golem's death throes. Tiber Septim was then crowned First Emperor of Tamriel, and ruled for thirty-eight more years. He was succeeded by his grandson, Pelagius I, to whom the Underking also appeared, claiming to have been sent by Tiber Septim to help the new emperor run his Empire. During the Imperial Simulacrum, the Eternal Champion was known to have encountered the Underking's minions, who were described as fanatical and seemingly insane. Of particular note, the Champion was tasked with retrieving a document from the lair of Golthog the Dark, a goblin chieftain rumored to be a necromancer serving the Underking in Hammerfell. In return, Queen Blubamka of Rihad assisted in uncovering the location of a piece of the Staff of Chaos. The Eternal Champion also recovered the Ring of Khajiiti from a crypt in Black Marsh where it had been hidden by the Underking. In 3E 401, the location of the Mantella was discovered by Nulfaga the sorceress, queen mother of Daggerfall. Around this time, Emperor Uriel Septim VII received word that the Totem of Tiber Septim had also been found. In 3E 405, Uriel VII sent an Agent of the Blades to the Iliac Bay region to investigate the death of King Lysandus of Daggerfall, and also to find a missing letter he had written to that kingdom's queen. The Underking figured prominently in many of the events to follow, culminating in the Warp in the West. Prince Arthago of Sentinel, eldest son of King Camaron and Queen Akorithi, had vanished in 3E 400; a popular rumor was that he had been taken by the Underking. Prince Lhotun wanted to know the full story, and hired the Agent to find out more. With the help of the Underking's minions, the Agent was able to uncover the truth—that the king and queen were behind the disappearance. The Agent's work in Sentinel eventually led to being contacted by the Underking to retrieve an item stolen by the King of Worms and his necromancers, which they had cursed and given to the Blades. The Agent was able to infiltrate the Blades' hideout in Ykalon and recover the item before it could bring harm upon the group. "Centuries ago, Tiber Septim ruled the land and forged an empire with great Numidium. The secret of Numidium's power lies in its heart, carried within the Mantella. It is the heart of Tiber Septim's battlemage. It is my heart. It is my Mantella. It is my Totem. It belongs to me, and to none other. I have won and lost an empire. I have no desire to tamper further with mortal affairs. I have in my possession Necromancer's Amulet, one of the world's greatest artifacts. You may have it in in exchange for the Totem." In the end, the Agent gave the Totem to the Underking, then travelled to Aetherius and recovered the Mantella. At the Underking's bidding, Numidium was activated once more; he awoke from his centuries-long sleep, raced across the bay to meet the automaton, and rejoined with his heart in a massive explosion. For a brief moment, he was flesh and blood again, then finally able to attain the true death he had long sought. The destruction of Numidium created an anti-magic zone of several miles radius around the area. Impossibly, through some sort of time distortion, each of the other six factions simultaneously obtained the Totem as well, and activated Numidium to their own ends. The resulting cataclysm permanently reshaped the kingdoms of the Iliac Bay, and the incident was later dubbed by the Blades as the Warp in the West. In 3E 433, the Champion of Cyrodiil travelled to the ruins of Sancre Tor in the Jerall Mountains to recover the Armor of Tiber Septim. The ruins had been sealed by the Blades in 3E 36 after four members had gone missing within. Once inside, the Champion encountered the ghosts of the four Blades, who had been cursed by the Underking along with the rest of the ruins. With their help, the Champion was able to break the curse and recover the armor. 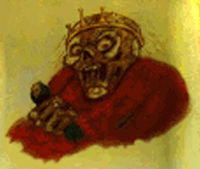 For game-specific information about the Underking, see the Daggerfall article. See the Lore articles about Zurin Arctus or Wulfharth for more information on these individuals.